Though making hot chocolate out of instant mix is pretty easy, there is no comparison when it comes to making your own homemade hot chocolate out of quality dark chocolate bars, whole milk, brown sugar, and your own favorite fresh spices. Simply chop up a bar or two of your favorite high-quality dark chocolate bar into small pieces with a knife. Set aside and heat whole milk combined with a pinch of salt and about a tablespoon of brown sugar in a pan until it starts bubbling at the edges. Whisk in chocolate pieces until smooth and steaming hot. Pour hot chocolate into mug and relish with whipped cream, candy canes, marshmallows, or whatever else you like to add. Need an extra alcoholic kick with your cup full of warm chocolatey goodness? Check out my post on 8 Hot Holiday Alcoholic Drink Recipes to Warm Your Spirit, which includes a recipe for hot chocolate peppermint Schnapps. 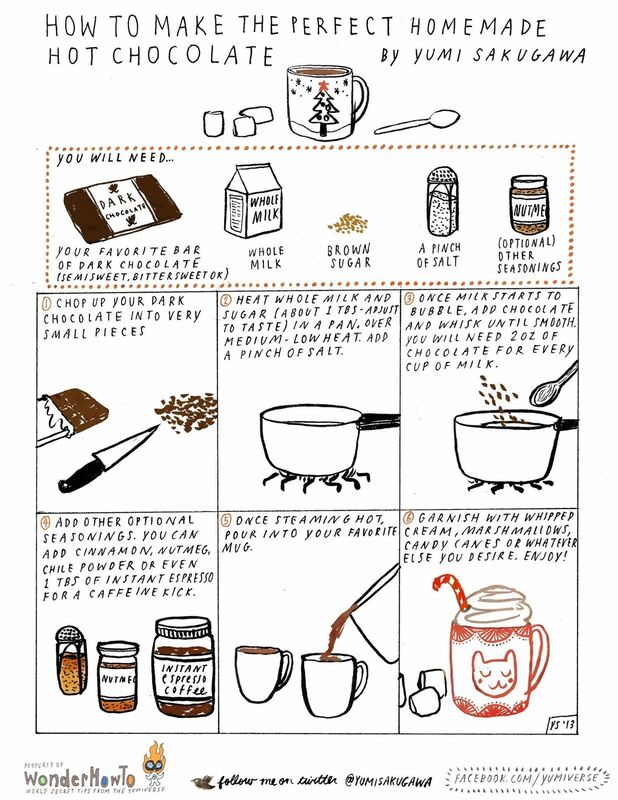 Got your own favorite techniques for making your own hot chocolate at home? Share with us.